Mayan Highlights – The Great Canadian Travel Co. If you have always wanted to explore the Yucatan, but don’t know where to start or what to do, this wide-ranging itinerary will let you really see one of Mexico’s most fascinating regions. Snorkel Caribbean reefs and laze on beautiful white-sand beaches. Enter the world of the ancient Maya at Chichén Itzá and the incredible jungle ruins of Palenque. Explore the region’s hidden gems with an experienced guide, taking the hassle out of travel so you can focus on ancient ruins and vibrant sites – or revel in a tranquil sunset from Playa del Carmen beaches. Welcome to paradise! You can arrive at any time throughout the day, but your presence is requested in the evening for the welcome meeting. Enjoy a guided tour of the Mayan ruins of Chichén Itzá and then take an orientation walk in Mérida to get acquainted with the city. Mérida has plenty of museums, plazas, beautiful architecture, open markets and outdoor cafés to keep you busy. 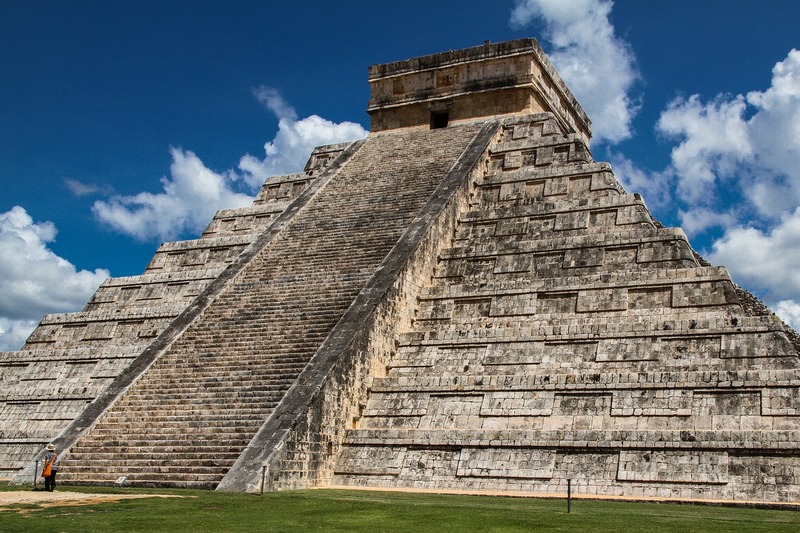 Chichén Itzá includes a 30m (98ft) high temple, known as the Pyramid of Kukulcan, famous for its balustrade of 91 stairs up each of the four sides, a ball court with a grandstand, and towering walls. There is a lot to see and do in Mérida so we provided you with today to be able to explore on your own. Some optional activities: Visit the ruins of Uxmal, take a dip in the underground pools, go bird-watching, or relax on the beach in Progreso. 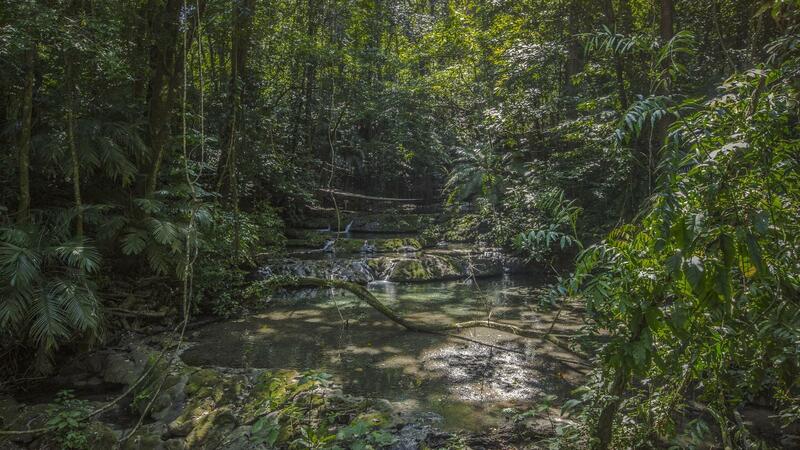 Today is a travel day to the lush dense jungle of Chiapas in Palenque. 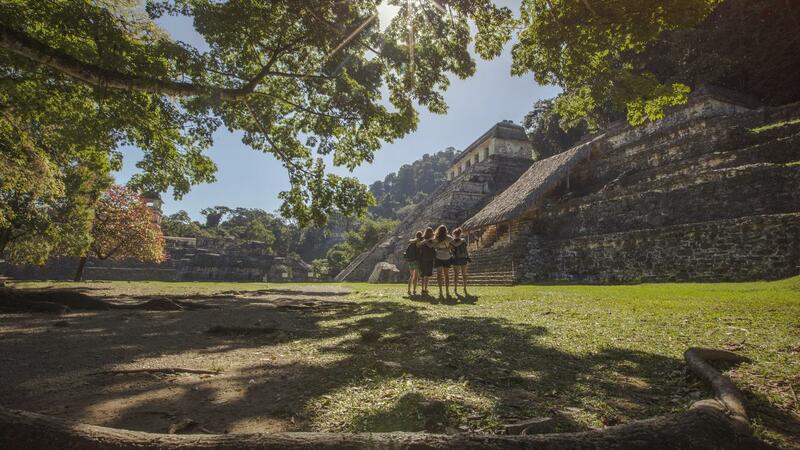 Enjoy a guided tour of the Mayan ruins of Panenque today. See the Temple of the Cross Group, Temple of Inscriptions and the Grand Palace. Listen to the howler monkeys as you are guided through one of the most important centres for trade and culture during the end of the Classic Maya period. 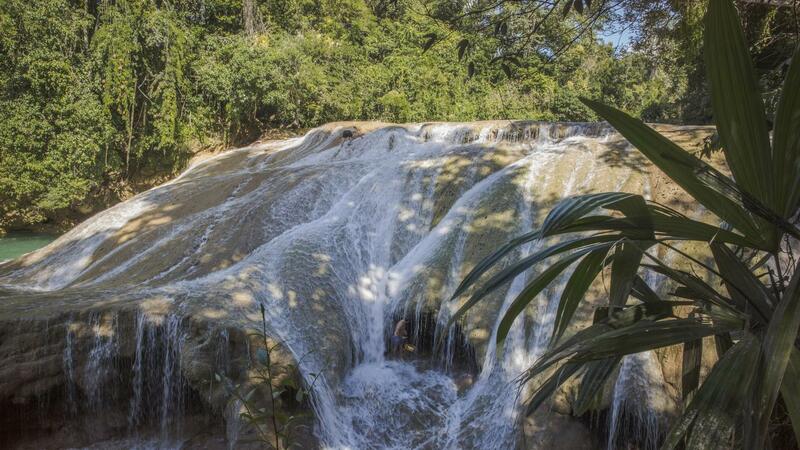 Later, choose from one of the many optional activities in the area: Jungle Trail Hike or have a swim and explore the cascading Roberto Barrios Waterfalls. Don’t forget your sunscreen today as you will be transferred to Bacalar to spend time on the beach looking out at the crystal-clear lake. Choose to go kayaking or explore the San Felipe Bacalar fort, built in 1729 to fend off further pirate attacks. If you didn’t have a chance to kayak or see the fort yesterday, today is another day. Kayak the pale blue waters of Laguna Bacalar or visit the original stone walls and canons of the San Felipe Bacalar fort. 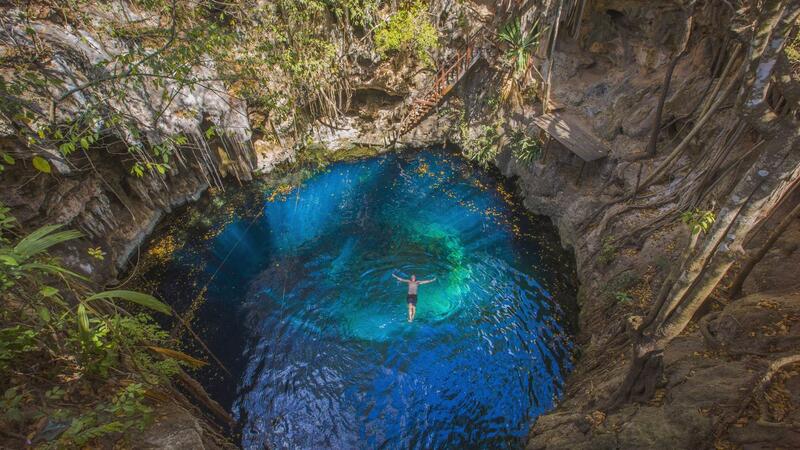 If you’d like to test your cliff diving skills, you can leap into Cenote Azule, a natural pool that is 91m (300ft) deep and 183m (600ft) wide. 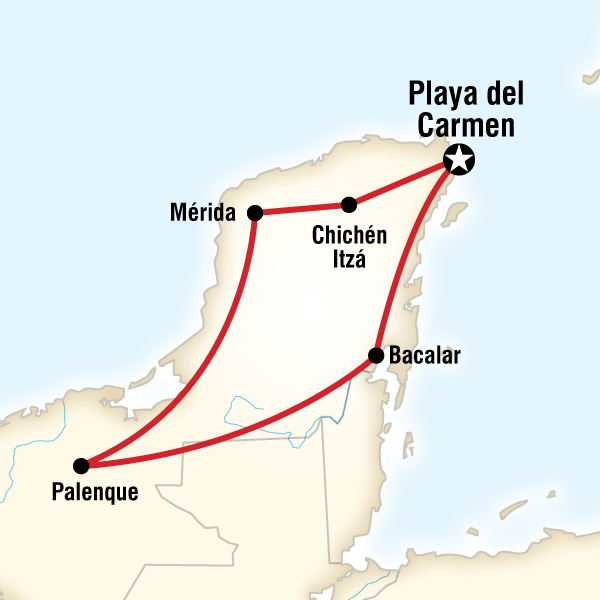 Today you will travel back to Playa del Carmen to lounge on Mayan Riviera beaches. Enjoy the nightlife, buy last minute souvenirs and relax. There is opportunity for snorkelling and diving, as well as long stretches of sandy beaches which are perfect for walking and relaxing after a hectic day. Looking for exciting things to do? Ask your guide, they’ll let you know of all the cool adventures awaiting you close by. You are free to depart at any time.